Phong has been a member of the Folsom Symphony’s first violin section since 2011 and is currently the Assistant Concertmaster. He received his violin performance degree from the Royal Conservatory of Music, Canada and has performed professionally with several Canadian orchestras including the Ottawa Symphony and the National Art Centre Orchestra. Phong also received his engineering degree from the University of Ottawa and was a Program Manager/Software Engineer at Intel Corporation. 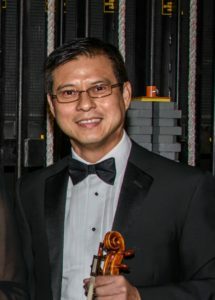 Phong is currently a private violin teacher and enjoys participating in classical and contemporary music performances.